Please join your SWE PNW officers a montly SWE PNW Digital Digest & AMA! This is part of our regular online event series to help communicate key Section and other SWE news and events to you as members! The interesting stuff, we promise! Our agenda is typically planned for 15-30 minutes and may include a featured topic in addition to the agenda provided above! Our Ask Me Anything (AMA) portion will take submitted ahead of time or through our Facebook page and group. We'll stay online for questions as long as we get them, wrapping up no later than an hour after we start or whenever there are no additional questions coming in (which ever happens sooner). This will be an online, live broadcast for anyone to attend! The event will also be recorded and made available for replay on our YouTube channel. How do I submit a question ahead of time? If you have a question you'd like featured in the AMA section, email it to swe.pnw.pres.elect@gmail.com with the subject line "SWE PNW AMA Question." Be sure to submit at least two days ahead of the event you would like to see it featured in. No worries - if we don't get it this time, we'll catch it for the next one or send you a quick email back to answer it! Where can I find past SWE PNW Digital Digest episodes? You can find them on our YouTube Channel here. We even have a playlist for the full length episodes here. 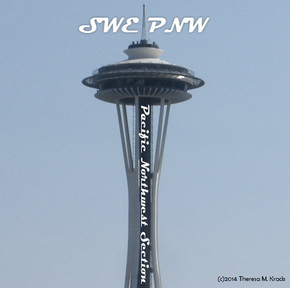 And the Minute (or so) with SWE PNW playlist is here. How will I know what the featured topic is for the event? All updates to the event will be posted to the Facebook event discussion. You can find the full list of our section events here. Click on the SWE PNW Digital Digest event to see updates on featured topics, hosts, and special guests.